Chris Annakin featured for Dewsbury against York having joined the Rams on a one-month deal from Wakefield Trinity. Dewsbury Rams coach Lee Greenwood gave an honest assessment to his side’s narrow defeat against York City Knights last Sunday. 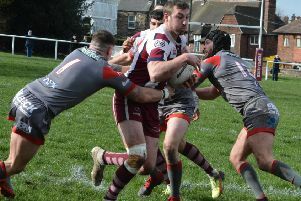 The Rams twice looked to have the game won as they led 16-0 and then edged 22-18 ahead with a 71st minute try only to concede late on and slip to a 26-22 defeat to the newly promoted side. Greenwood believes there are positives to work on but said York deserved to leave with the points. Speaking after Sunday’s game, Greenwood said: “I thought the best team probably won over the 80 minutes. We just weren’t smart enough to keep hold of the lead and then keep hold of it again for a second time, so I think York fully deserved it. “We had done well for 40 minutes and worked really really hard to get that lead but then we started giving it away really easily. Greenwood also admitted his side conceding 14 penalties during the game did not help. He added: “There were too many penalties and York sped the game up with their taps. “A lot of the penalties came from not being in control of the tackle. Whether some of them were I am not too sure but we will always look at our defence first and some of it wasn’t good enough. “The body language and energy was really poor and that is what I am trying to change. “I’m guessing that may have been similar to what people saw last year and the year before where once a team gets on a roll they dig themselves into a hole and can’t get out of it and that is my job to change it.